I zoomed out of the street view, up to the bird’s eye view until I could see Budapest, the Hungarian capital where in a month I would have a work-related meeting to wrap up a research study collaboration I had been working on for the past eight years. Just how far was it? Again, I consulted Google maps. A four hour drive. I knew just who to call. Tamas, my friend of nearly 20 years from my college days, and his Slovak-speaking partner Istvan took up my cause with great enthusiasm. They live in Budapest and from there organized a road-trip to Slovakia for the weekend before my work meetings. 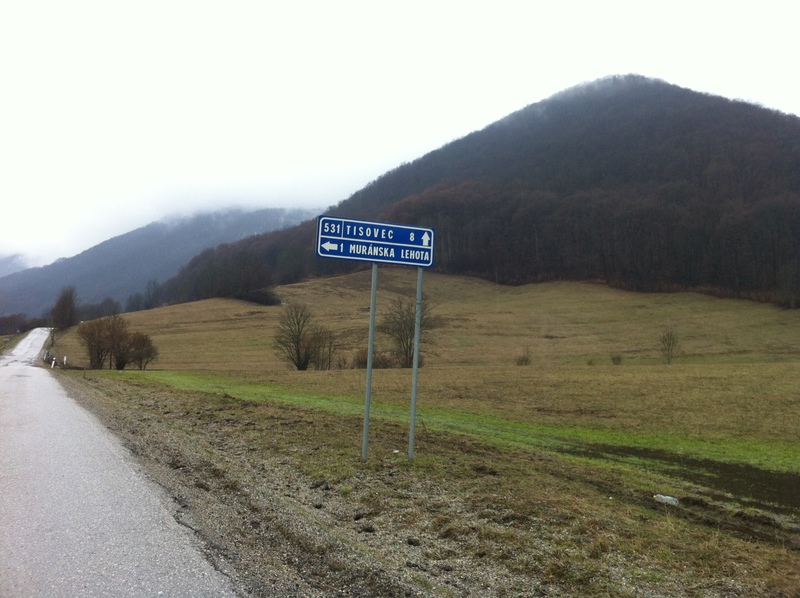 On the first Friday in April of 2013, in a car borrowed from Tamas’s grandfather, we followed the path of Google maps out of Budapest and its northern suburbs. 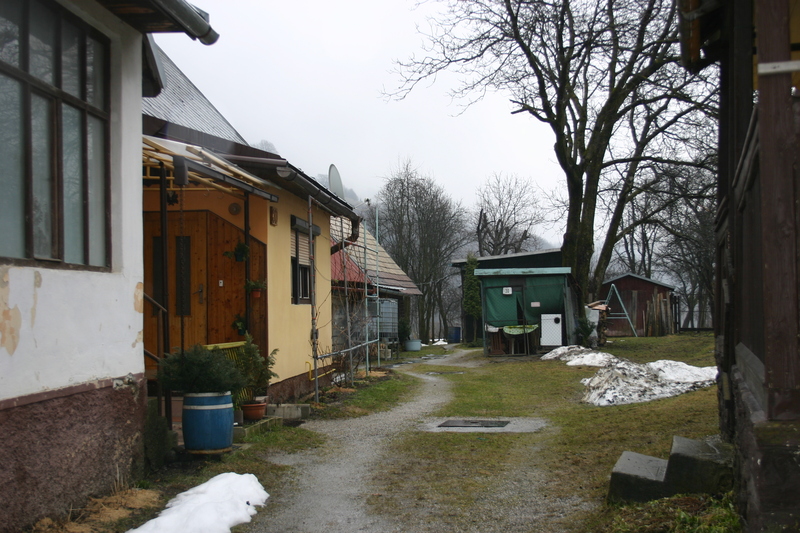 We journeyed through the rolling hills of northern Hungary, into the Low Tatras of Southern Slovakia where five feet of plowed snow lined the roads in some places. Potholes were in full bloom. We carefully dodged them and the Roma families walking on the highway. The forest all around us looked like a Brothers Grimm fairy tale. Logging trucks driven by pot-bellied, dark-haired lumberjacks passed us with confident swagger. Deer, hawks, and storks trolled the wilderness for food. The mist was thick and a light drizzle coated the windshield. Tamas flicked the wipers and a distinct smell of palinka, Hungarian plum brandy, rose from the air vents. “Sorry – my grandpa must have run out of windshield wiper fluid again,” he explained with a chuckle. With that we made the turn towards Muranska Lehota. The access road was just as I remembered it from my virtual wanderings – lined with trees and fields, a large fishing lake on the perimeter. Tamas slowed as we approached the edge of the village. “Turn right. House 29 is a few houses up on the left,” I said. I knew where to go. I had been there many times since the night I first discovered it, walking up and down that street like a pacing ghost. We parked the car. I felt like a time traveler as I approached house 29 and unlatched the gate. My great-grandmother Mary had left there in 1912 to marry my great-grandfather John who once lived in house 31, but had since immigrated to Johnstown, PA. House 29 and house 31 shared a yard. The story goes that John and Mary played together so nicely that their mothers arranged their marriage when they were children. Probably in this yard, I thought as I stood between the two houses. We knocked on the door of house 29. No answer. We knocked at the adjacent house 30 and then house 31 without luck. We walked up a few houses and found a woman on her porch. Istvan asked about house 29. She looked at us cautiously. 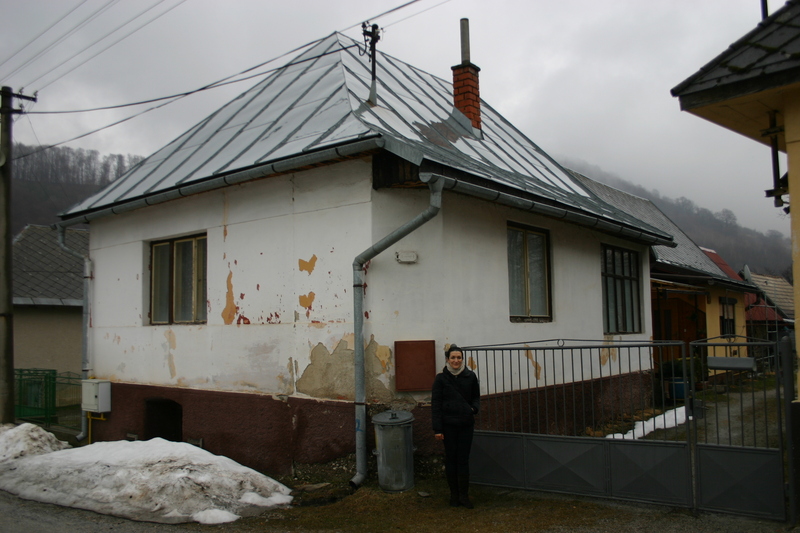 Istvan explained that I was from America and my great-grandmother was born in that house and we wanted to have a look inside, if possible. The woman looked me over and said, “Senko. That house belongs to the Senko’s.” I fought back tears in my eyes. “No one lives in house 29 – the man who owns it lives in another town. The people in house 30 and 31 have the key, but they are at the spa today. The cemetery is that way,” she said and went about her business. I didn’t want to push it. My aunt Becky had been here in 1968 and Grandma Pauline and my aunt Marianne had visited relatives here as recently as 1981. But as far as I knew, everyone they had been in contact with had since died. I really didn’t expect more that to just walk in the village. “In the old days, people could be arrested for admitting that they had relatives in America,” Istvan said quietly as we walked. I wasn’t surprised. In preparing for the trip I had read up on everything I could get my hands on, and I knew that the mountain-people in these parts had seen their share of passersby over the centuries. These were the mountains where Robin Hood-type characters hid out, where Protestants and Jews sought refuge in times of religious intolerance, where folks from the lowlands took refuge from Ottoman raids, where the Austro-Hungarian bourgeoisie played house in mountaintop castles and conscripted their cannon-fodder, and where in the recent past Nazis and Communists swept through. We walked up the hill, away from the village. There were balls of mistletoe in the bare trees all around. From Google maps I knew that the ruins of the Muran castle are nearby and visible from here. My great-grandfather John was so interested in the history of the castle that he had a relative hand copy an old book about it and mail it to him in America in the 1950s. Muran castle is the highest in all of Slovakia and sits on a mountaintop called Ciganka – or gypsy woman in Slovak. Legend has it that in the 1300s, the first owner of the castle fell in love with a gypsy and married her. They later had an argument and he threw her down the mountain, hence the name. The castle was also home to the Venus of Muran, who in the 1600s used her good looks to thwart an impending siege on the area. Unfortunately, with all the mist and snow, I couldn’t see much beyond the pine and beech forest. The cemetery was three-quarters full of headstones with “Senko” and “Vavrek” – my family surnames. I recognized some names from a family tree Grandma Pauline had drawn up when she was here. It was exciting and depressing at the same time. I noticed that someone had recently put plastic flowers and votive candles on the graves, though everything was shuffled around a bit as usual when there is a big snow that melts. We walked back down the hill towards the village to the church. It was locked, but the woman at the village store called someone who let us in. This man did not offer his name and gave me a look-over when Istvan explained my story. He kindly let us into the church where I took many pictures and gave a donation. It was immaculate. 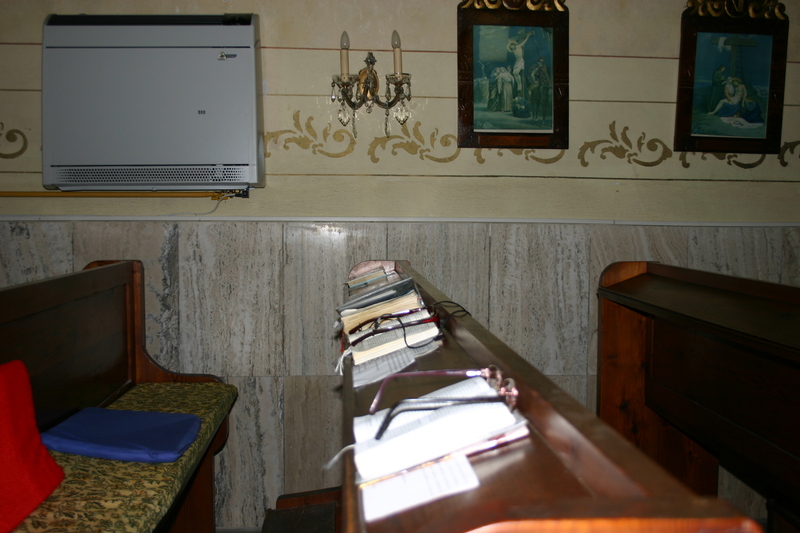 Glasses were perched on prayer books. I was thinking it was the tiniest church I ever saw when he boasted that they recently put on an addition. I thanked him and gave a donation. We next went to the only other public structure in the village, the culture house. It had pictures of an Easter event and other plans listed. There were pictures posted of people playing games – old and young folks. I felt hopeful. On the side of the culture house were two plaques – one listed all of the men of the village who had died in World War I. There were three Vavreks. Where they relatives? No one ever talked about them. The second plaque was to the Soviets for liberating the village from the Nazis. This too gave me pause. I can imagine how fortunate John and Mary must have felt about leaving when they did and having their children in America, but also the silent guilt that must have plagued them. I went back to the yard between houses 29 and 31 and stood. I thought about all that happened there. I thought about Grandma Pauline and wondered how she felt when she walked down these streets knowing that fate could have had her born in house 29 just as easily as it had her born in America. I thought about my dad and how I now somehow understand his obsessions with mountains and hawks and history. Then I thought about people I will never meet, but whose blood I share. And I wondered did they, do they have the same passions and curiosities that I have? What would they say about a time traveling relative looking for their homes on Google maps, virtually pacing up and down their streets, and then showing up one sleepy 21st century morning? I thought about how time passes and how in a world with ever-changing governments, technologies, and demands, John’s and Mary’s houses, yard, and church sit intact exactly where they left them 100 years ago, and how grounding it is. I promised myself I would return. Judi-As always your writing is so intriguing! Thanks, Carole – I appreciate your encouragement! so thats how the first visit went:) this is giving me flashbacks to how i felt in Croatia! sure hope we can all go there together too! Yes – I hope we can pull off another family reunion in Europe in the near future – what an experience!